Your direct mailer must have impact and relevance. Its message, content and format need to cut through and gel with your potential customers. If it doesn’t make them sit up and say ‘wow’, it’s destined for the recycling bins. Take time to filter ideas and develop a strong, imaginative concept. Personalise or tailor the message and content wherever you can. The more relevance it has, the more the recipient will recall, value and respond to your mailing. 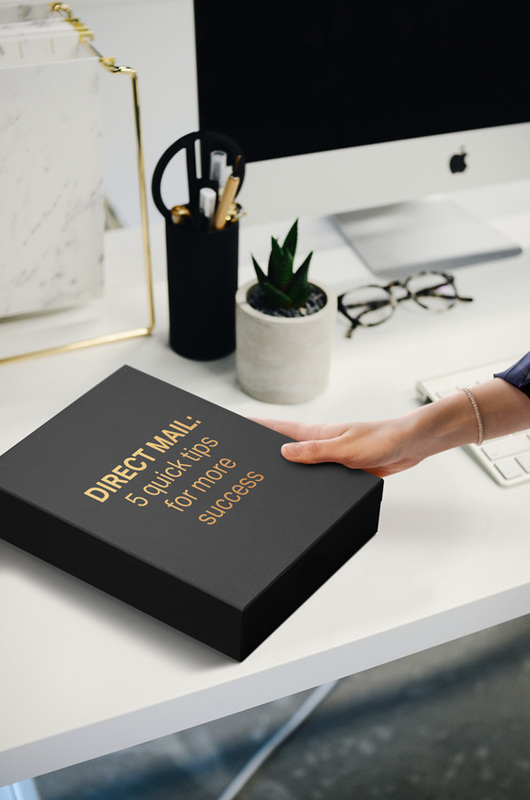 Sounds obvious but if you’re spending good hard cash on sourcing gifts, producing packaging and mailing, it pays to make sure your DM is correctly targeted. Ensure that each target individual is correctly identified and that all contact details are perfectly accurate. With so many people working from home or multiple locations it makes sense to double-check postal addresses. That way you know your beautiful mailer will land in front of the right person at the right time. Sometimes you can rely on an unprompted response to your mailer, but for better results support your DM using other channels as part of an integrated campaign. Well targeted social campaigns, emails and sales calls are great for warming up your target audience and driving the interaction online where you can deliver richer content. Well-timed follow up calls can verify the mailer’s been received and kick-start a sales dialogue. Don’t cut corners when it comes to the look and substance of your mailer. The quality of concept, design and production should reflect your own brand values. Design packaging that looks the business and protects contents from the rough and tumble of the postal system. Ensure perishable items arrive in good time. Check your mailer and its contents are not considered offensive or inappropriate for cultural or religious reasons. Direct mail is a great way of engaging at either end of the funnel. Use as a door-opener to engage cold prospects or to tip warm prospects into hot sales opportunities. Make it effortless for recipients to respond by including prominent and clear calls to action on all elements of the mailing. Provide a choice of CTAs in case they prefer to get in touch via email or phone.